The style of minimalism is a design approach that is characterized by austerity and laconism in decoration. 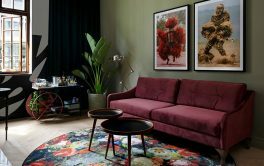 It is mainly achieved through the use of functional furniture and interior objects, geometric shapes and a combination of usually not more than two basic colors. It is extremely important in such design to correctly divide the space. 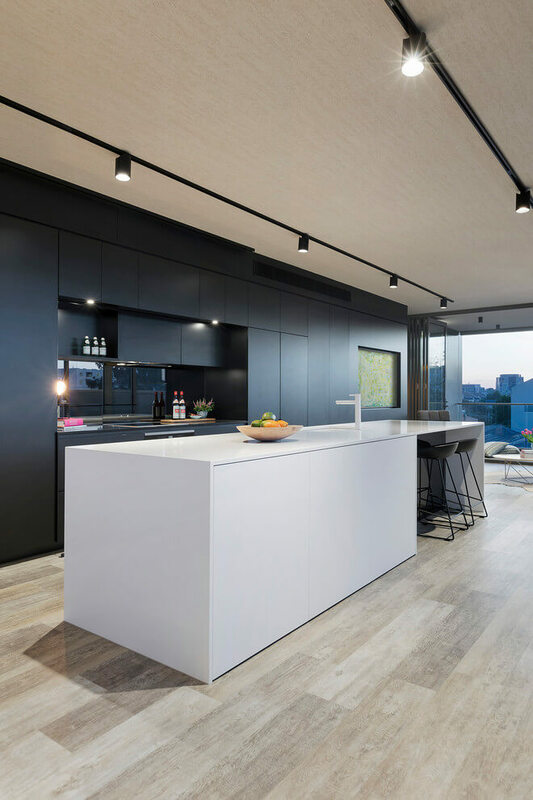 Minimalist interiors are usually compact, black or gray, and have a strict geometric shape. The interior design in the style of modern minimalism implies a lot of space, so it is desirable to get rid of partitions in the room. There is a need for massive windows to fill the room with enough light. The color scheme is created using the game of halftones. The most common choice: white color combined with graphic gray. Materials: chrome steel, glass, plastic, ceramics, artificial and natural stone, textured wood. 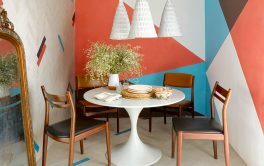 Table, sofa, furniture, and chandeliers in the style of minimalism have a simple geometric shape. Forms are allowed with a slight bend, but not a spiral. Artsy decor and ornaments are not a choice. Walls can be decorated with a couple of minimalistic paintings. The design is characterized by flat reflective surfaces. Each piece of furniture has strict proportions and color. Instead of curtains, horizontal or vertical blinds are used. The light is scattered. Neon or halogen ceiling lamps are often used. The interior of the room in the style of minimalism is ideal for those who are tired of pretentiousness and craves for elegant simplicity. To do this, you should abandon the decor and non-functional parts. 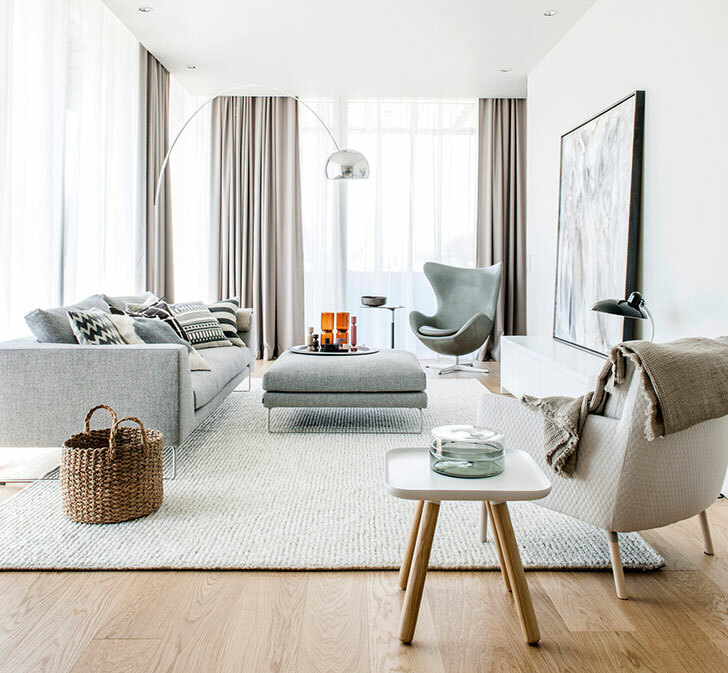 Minimalistic rooms are dominated by the spaciousness and a large amount of light. Finishing with textured plaster, wide glossy tiles, paint or wallpapering is allowed. The walls can also be made of glass, concrete or natural stone with a relief. The ceiling should not burden the interior and be bulky. Therefore, the content of complex elements in its design is unacceptable. It is best to paint it in a light color. The laconism of such interiors in the best way can be expressed with the flooring without a pattern in natural colors. There are several flooring options: laminate, polymer coating, parquet, plain carpet, self-leveling floor and ceramic granite tiles. Different rooms allow different flooring. The bedroom will look comfortable with a long nap carpet. 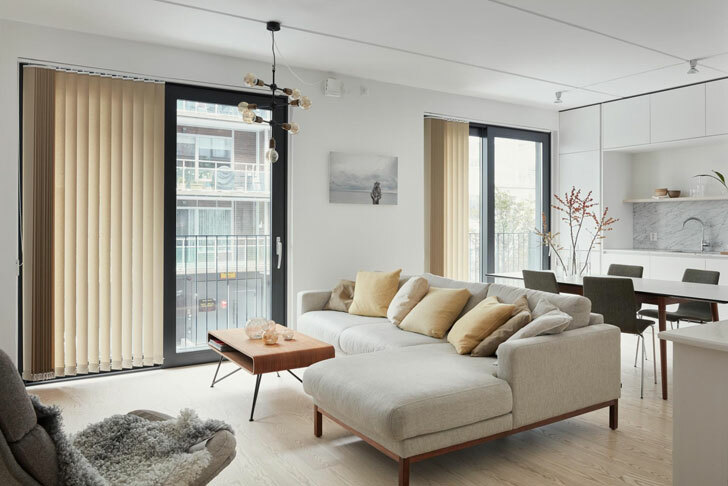 The minimalist style in apartment design is about a streamlined shape and a large space while remaining cozy and attractive. 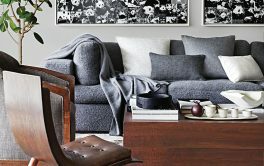 Think about what furniture can be removed from the apartment without sacrificing comfort. Choose a few items of simple, concise form. Keep only functional items on the table and surfaces. If you correctly select all the decor details, you get a room where there is plenty of space, light, and air. Following the principle of “less is more”, get rid of objects that weigh down and distract. 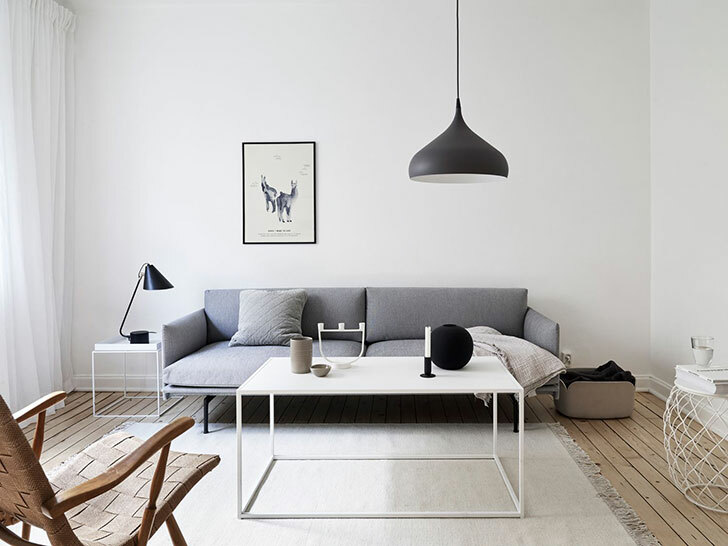 For such interiors minimalism in furniture is ideal. For example, a simple cabinet that can be built into the wall. As a rule, it has no back wall, and its shelves are attached to the wall. 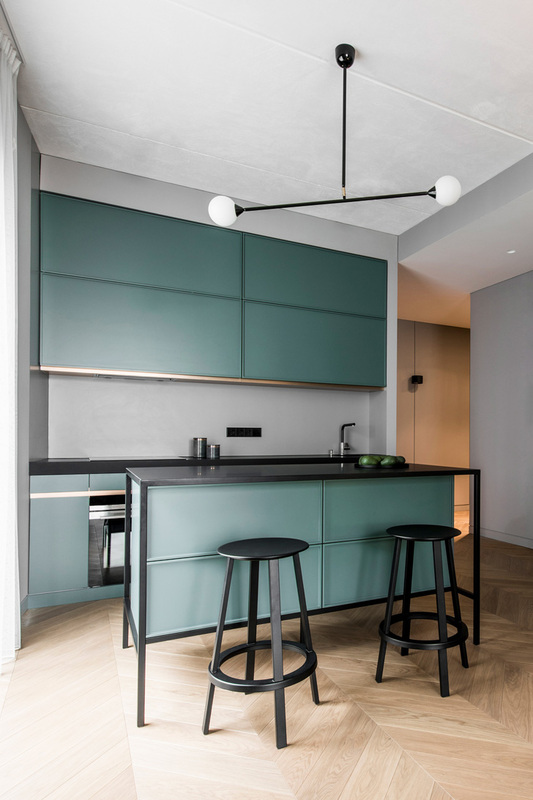 It is excellent if the cabinets and furniture seem to merge with the ceiling and walls, creating a feeling of free space. When choosing furniture, remember that personal items should be out of sight. Therefore, it is better to choose shelves with doors and closed racks, as well a low sofa. 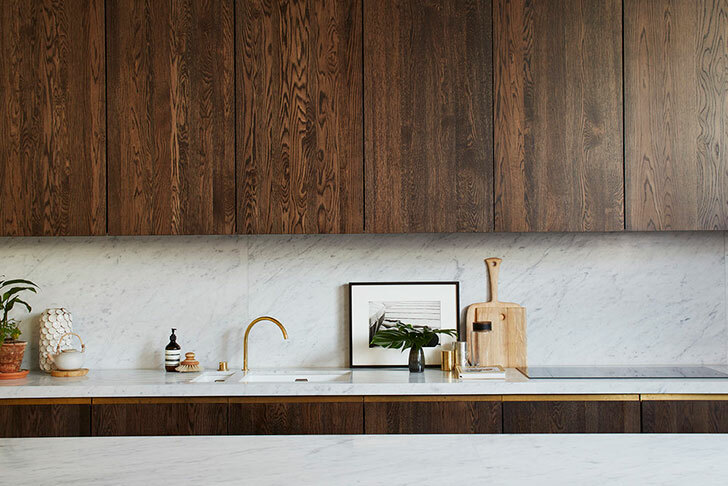 A kitchen designed in the spirit of minimalism should breathe cleanliness and order. As in any other room, glutting with unnecessary objects is unacceptable here. Therefore, all household appliances should be hidden. The choice of materials is wide: natural stone, brick, wood. Glass and chrome steel are also often used in finishing. Beige and white are the best for walls, which can be advantageously diluted with gray and brown pieces of furniture. The floor is covered with floorboard or tiles. 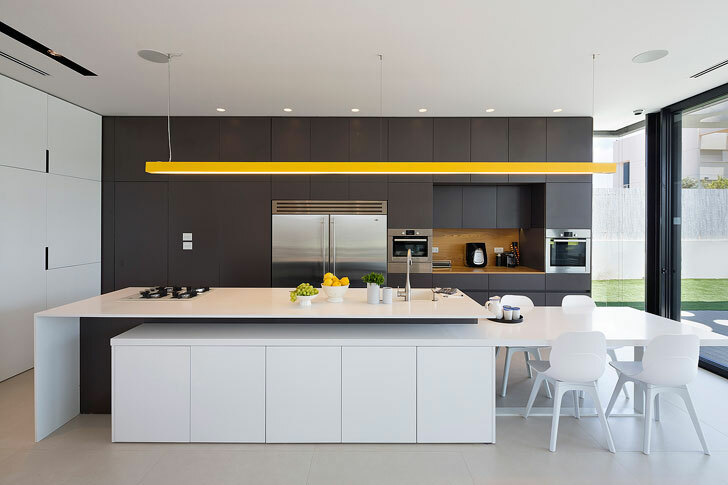 The interior design of the kitchen in the style of minimalism implies the presence of furniture with simple shapes. The perfect design of the bedroom involves a spacious room in which there is a lot of sunlight. It is advisable to choose calm, warm shades. There are combinations of lilac and beige, as well as gray and white. You can put a solid carpet on the floor. 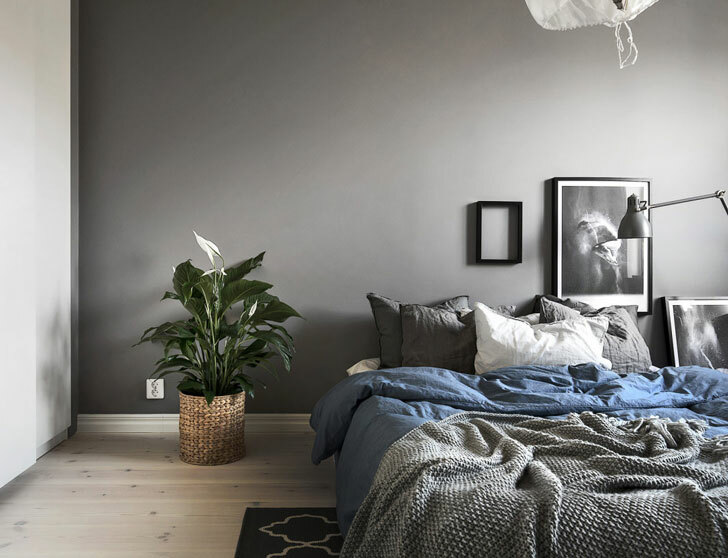 The perfect minimal bedroom should be comfortable. 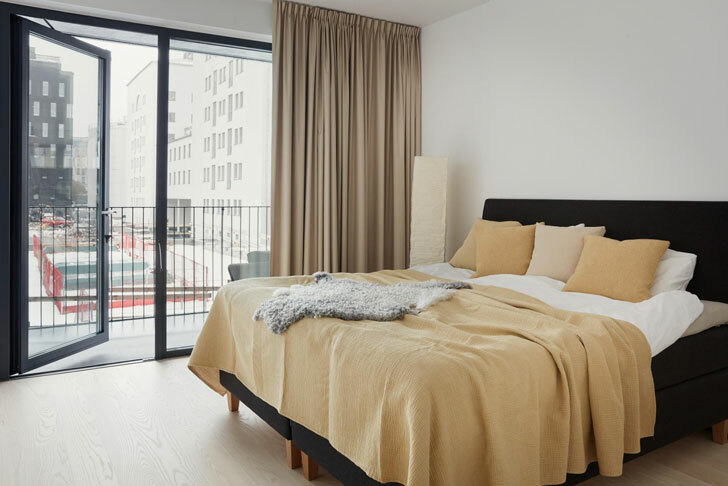 The minimalist style in interior design of the bedroom is created by a small amount of furniture. It will be convenient to store things in the built-in wardrobes and bedside tables of a simple form. Mirror and fixtures can be mounted in the wall. It is advisable to choose the most simple curtains or use blinds. The bed in minimalist style has a laconic form. Designers advise giving preference to a wide bed with a wooden headboard. Next to it, functional tables, on which lamps can be placed, will look good. Massive pot with live plants will be also appropriate. Many houses of this style have a simple and functional layout, which provides a lot of space. 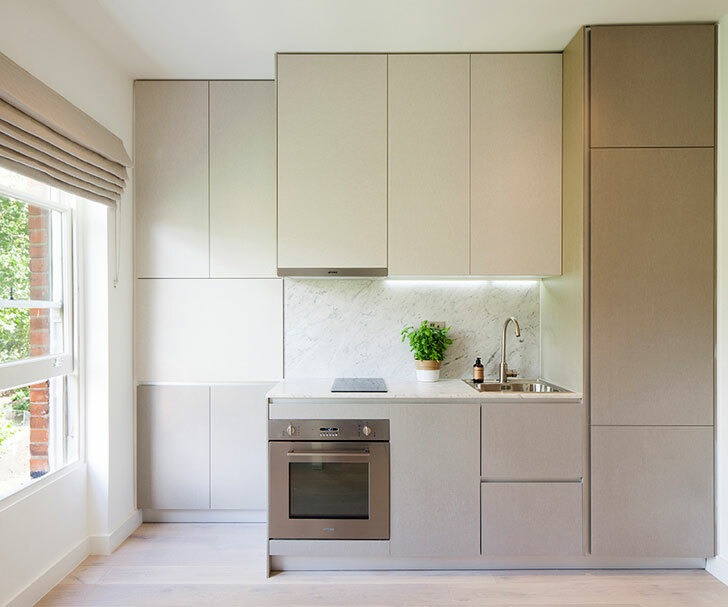 Plain shapes, open floor plans, the virtual absence of interior walls, small storage rooms and an emphasis on high daylight access define interiors of a house in a minimalist style. 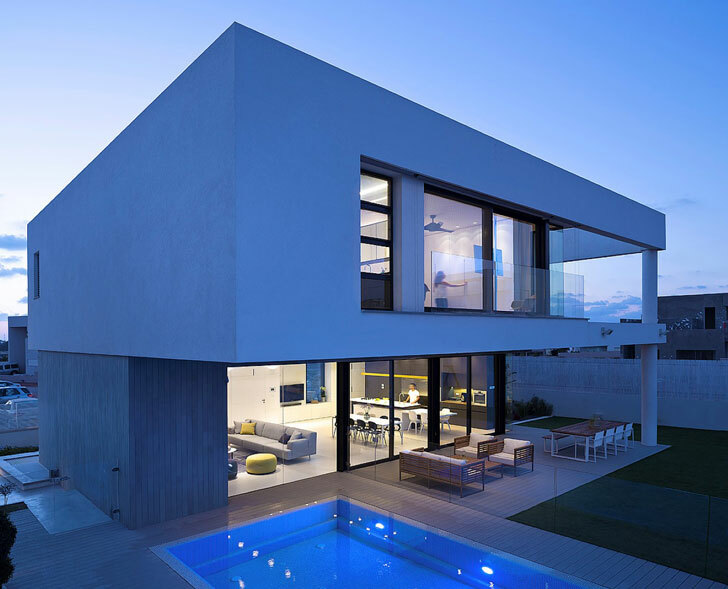 This simple house design avoids many entrances and exits, and also has no bends or corners. 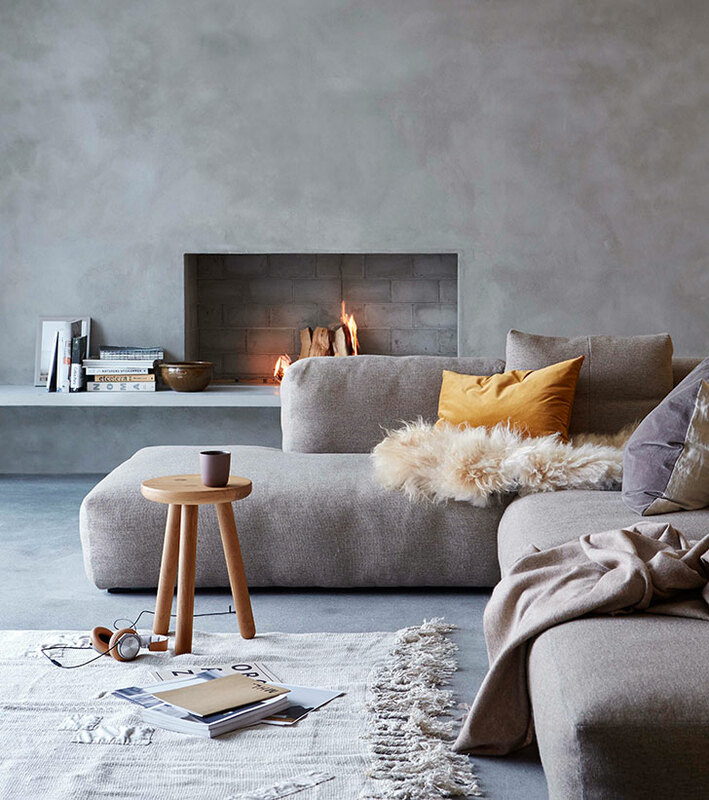 Minimalistic living rooms are the best in modern design as they bring the luxury of understated elegance to everyday life. With the right design, you will get a room with a positive, bright energy. 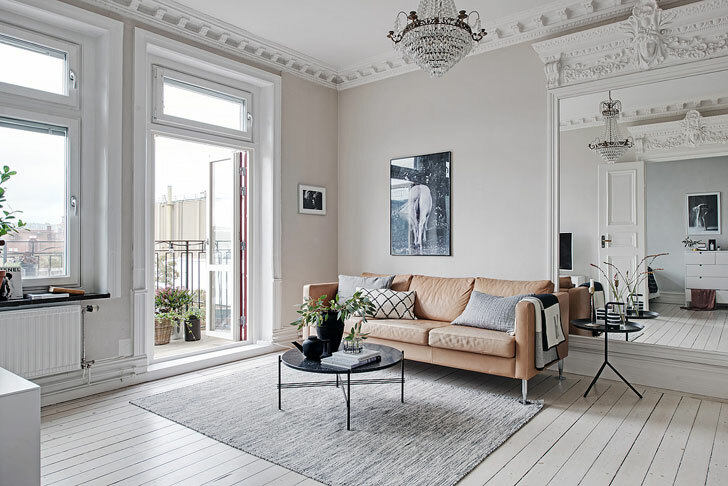 Usually, for decorating the living room you can use classic shades: black, white, beige and gray. It is also permissible to introduce bursts of bold shades such as orange, red and green. The interior design of the living room in the style of minimalism should be thought out to the smallest detail. It should harmoniously combine open space, rigorous forms, and functionality. Proper lighting is an important element of the living room. 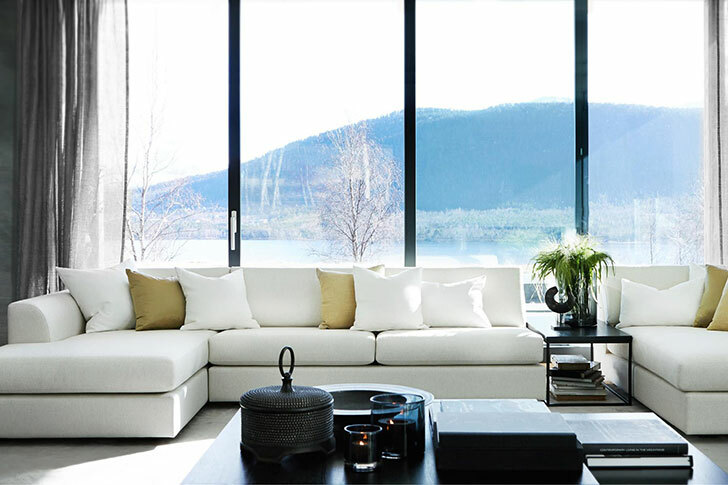 Large windows provide plenty of light, making your living room more visually large. TV is better to install on the wall while cabinets should be built-in. Also, pay attention to items with flat reflective surfaces. Furniture for the living room in the style of minimalism (sofa, chairs, coffee table) should have geometric shapes and smooth silhouettes. The interior and bathroom fixtures are restrained and rigorous. The style does not tolerate the presence of more than two primary colors. Alternatively, you can choose a beige bath with a brown finish. The flooring should also not be full of textures and colors. It is best to put tile or waterproof laminate. 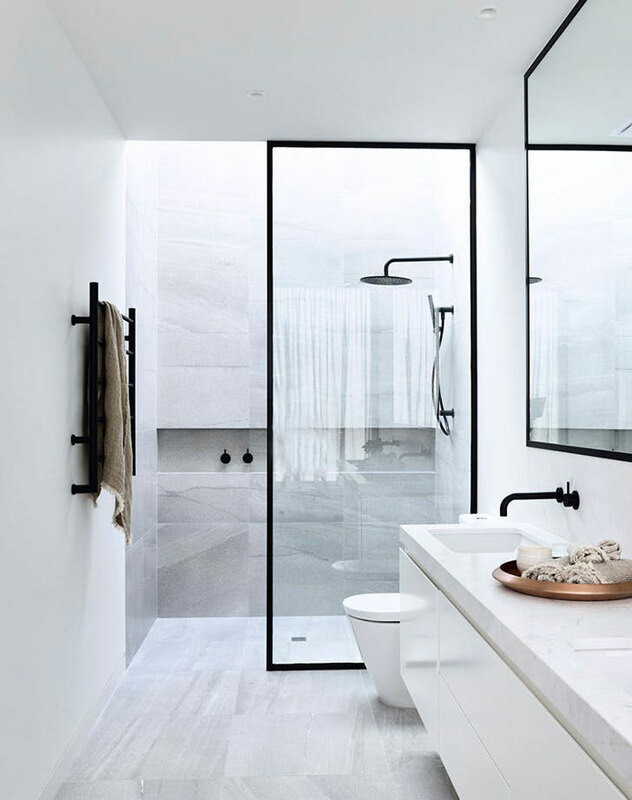 The interior design of the bathroom in the style of minimalism excludes paintings, bas-reliefs and more. There is a wide range of facing materials: wood, metal, glass. It is important to limit the number of bath accessories. Shelves with roller shutters look neat and do not overload the room. Metal mounts for mirrors and towels fit perfectly. It is also necessary not to forget about ambient lighting. 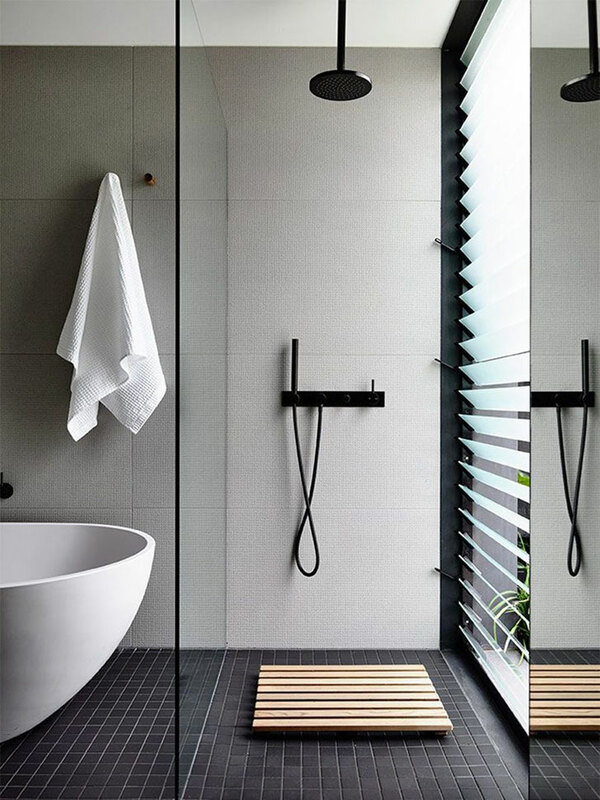 A minimal bathtub should be of a simple geometric shape without unnecessary details. The design of an entry should also combine no more than two colors. You can take as a basis white, beige or milk. As for furniture, it is better to choose a functional wardrobe for outerwear and a shelf of regular geometric shape for shoes. 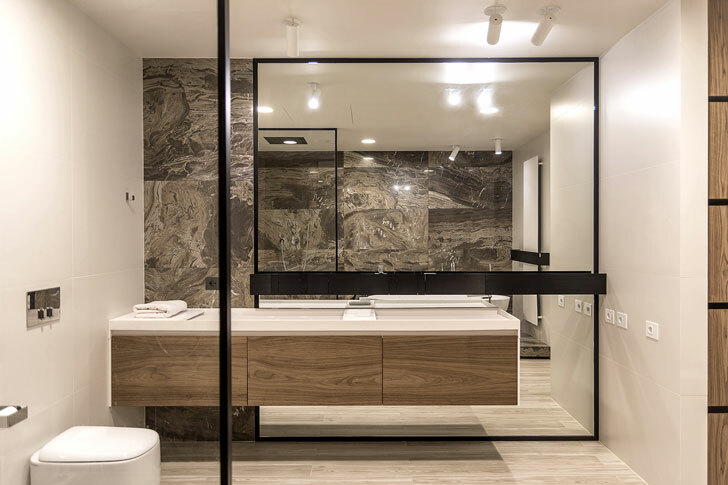 To visually expand the space, you can purchse furniture with a mirror surface. 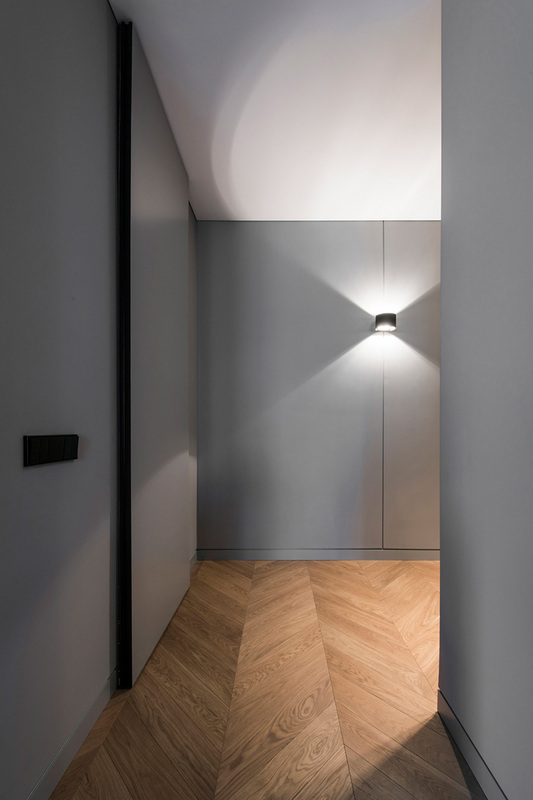 The minimalist entry interior involves diffused lighting coming from the lamps merging with the furnishings. Kids room in this style is ideal for a family with several children. If you choose functional furniture, you can significantly save space. To do this, you need to fix a few wall cabinets on the wall, which will store books. 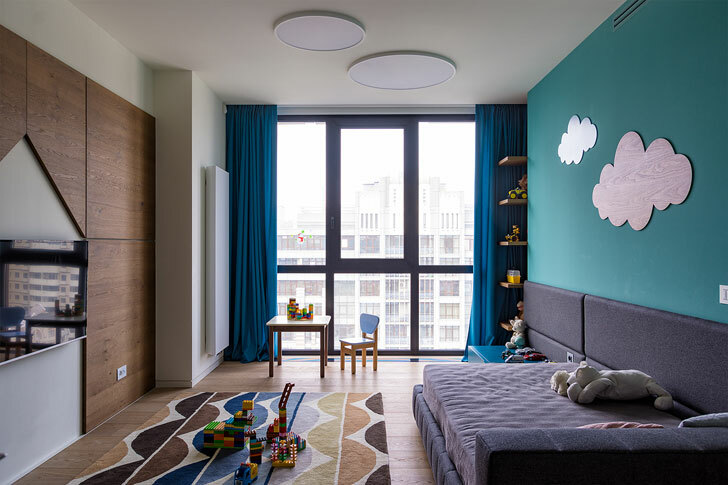 The design of a kids room usually starts with the selection of colors. As a rule, these should be light shades for walls. They can be painted or finished with light wallpaper. The design of a teen room in the style of minimalism involves a folding bed. The advantage of such a bed is that its lower part extends to sleep and retracts during the daytime. Also, to save space, you can use furniture-transformer. Such a space will be a great place for games and creativity.